Is Stevia Sweetener Better Than Sugar? If you are a health-conscious consumer, you may have considered using a stevia-based product to sweeten your coffee, tea, or baked goods. The sweetener is considered by some to be a healthy alternative to other low- or zero-calorie sugar substitutes on the market. In fact, many stevia-based products advertise that they are all natural. But "all natural" doesn't always mean "all safe." Before including stevia in your diet, learn more about stevia side effects and benefits to decide if it is right for you. 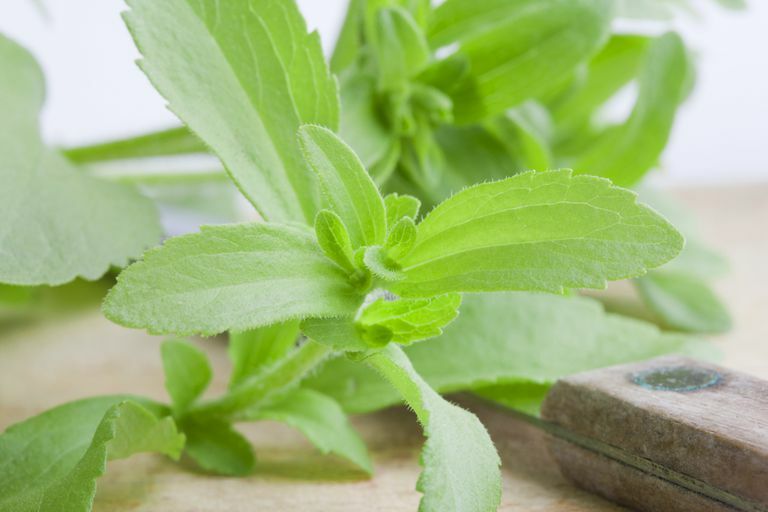 Stevia, also called Stevia rebaudiana, is a leafy plant that looks a little like mint. Its leaves have been used in South America for centuries. Tribes in Paraguay, Brazil, and Bolivia have used stevia leaves to sweeten teas and traditional medicines. Stevia leaves are the raw material used to distill the chemical referred to as reb-A (steviol glycoside rebaudioside A). This super sweet chemical is used in a variety of products including sodas, juice drinks, baked goods, and a variety of candies. Stevia products also include toothpaste and other dental products. Stevia leaves have up to 150 times the sweetness of sugar and the extract can be 300 times sweeter than sugar (compared to Splenda, which is 600 times sweeter than sugar). Adding to its appeal is the fact that stevia products (that are not combined with other sweeteners) contain no calories. The taste of stevia varies from person to person. In general, when compared to sugar, it takes longer for the “sweet” flavor to kick in. But most say that the sweet flavor lasts longer. Some brands of stevia seem to have an aftertaste that is like licorice or slightly minty. The aftertaste is not, in itself, unpleasant, but it may interact with other flavors to produce an odd taste. Like sugar, stevia comes in a number of different forms—liquid, powder, and granules. There are many different sugar-substitute brands that contain stevia. Truvia and PureVia are two products that contain stevia and are available in the baking aisle of your grocery store. You can purchase many of these products in sugar-sized packets, liquid drops, and blends that also include real raw cane sugar. There are also dessert products that use stevia instead of sugar such as ice cream, jams, and jellies. Coke and Pepsi manufacture drinks that have these natural sweeteners in them such as Sprite Green, SoBe Lifewater, Trop 50, and other drinks. Keep in mind that while stevia is said to be natural, additional ingredients are added in the processing of many manufactured products such as erythritol, a sugar alcohol, and other flavoring agents, as well. Products that contain stevia may also contain other sweeteners, including sugar or sugar alcohols, which may provide calories and carbohydrates. It's important to check the Nutrition Facts label if you are following a low-sugar diet. Stevia has been approved for some time in Japan, China, Israel, and elsewhere. However, stevia clearance in the U.S. did not come until 2009. There was a study in the late 1980s that led the U.S. Food and Drug Administration (FDA) to issue a stevia ban unless the product was labeled as a supplement because the research indicated a possible cancer risk. The FDA's enforcement of the crackdown led to blogs and articles accusing the FDA of protecting the sugar industry by preventing the sale of stevia. Eventually, Cargill, the agricultural giant, was able to demonstrate to the FDA that reb-A containing products were safe and the FDA agreed. In December of 2009, the FDA issued a letter stating that reb-A and other products made from a specific part of the stevia plant and meeting purity standards of 97 percent or higher would be "non-objectionable" as food additives. This was a semi-reversal of the FDA's previous stance on stevia products. Keep in mind that the FDA's “no objection” to reb-A does not mean that all stevia extracts have been approved by the FDA. Only stevia products that meet the criteria of extraction are approved. One of the primary benefits of using stevia-based products is that the sweetener does not impact blood sugar levels. For that reason, it may be advantageous to people with diabetes and others who are looking to cut back on sugar intake. A few studies have shown that stevia-derived sweeteners not only taste sweet but also may help individuals improve insulin production—which in turn would help with diabetes. Some studies have even claimed that stevia can help in the management of hypertension (high blood pressure). However, stevia studies use different types of plants, different extraction methods, and different parts of the plants, making it difficult to compare data across studies. In addition, many of these studies are sponsored by the stevia industry. Not enough is known about stevia's effects to know whether these beneficial effects are true, but you will see these studies frequently mentioned on many stevia websites. The use of stevia products may help to reduce weight and obesity in some people. For many, a primary source of calories in the diet is sugar—particularly added sugars. By replacing sugar-sweetened treats with zero or low-calorie sweetened treats, it may be possible for some to reduce their overall calorie consumption to reach or maintain a healthy weight. However, some health experts have questioned the use of these sweeteners for weight control. There is some concern that using artificially sweetened beverages and other products may cause consumers to crave sugary foods and eat more as a result. Stevia (as with all plants) contains a number of antioxidants which help your body fight off the damage caused by free radicals (and limiting free radical aging). This puts stevia (assuming it is safe) way ahead of other sweeteners which contain no such beneficial antioxidants. What most consumers want to know is whether stevia is safe. Because of the FDA's stance on Truvia and other stevia products, it is likely as safe as any of the sugar substitutes out there. However, just because a substance appears safe in the short term doesn't mean adverse reactions might not reveal themselves in the long term. There are some areas of specific concern on which studies may provide some insight. Of course, you could argue that stevia is less safe because of the cancer finding in the past, but you could also argue that the "naturalness" of stevia combined with the centuries of use around the world make it safer. Various scientists have evaluated the safety of steviol glycosides, and have concluded that they're safe for both adults and children. However, a review of studies in 2017 noted that while stevia-derived sweeteners were gaining wider use, there have been no studies on its long-term effects on cancer or diabetes risks. One study of steviol glycosides fed to rats in huge amounts (far more than you'd use in your coffee) showed that the substance reduced sperm counts and caused other changes in their reproductive systems, which could impact their fertility. However, these studies have not been replicated in humans. Because it's deemed "generally recognized as safe" by the FDA, there is no restriction on using Truvia during pregnancy. However, women who are breastfeeding may want to exercise caution. Stevia hasn't been extensively tested as to whether it ends up in breast milk and so the LactMed database supported by the National Library of Medicine says, "Although risk to the breastfed infant appears to be low, an alternate artificial sweetener with more data available may be preferred, especially while nursing a newborn or preterm infant." Clinicians have never reported an allergic reaction to stevia. Lastly, it's important to avoid consuming large quantities of some reb-A-based sweeteners as they may cause some mild side effects and have the potential to cause more serious long-term issues. While reb-A itself is unlikely to cause problems, some products contain more than just the stevia derivative. For example, Truvia is only 0.5 percent Reb-A. The rest of the product is made of erythritol, a natural sugar alcohol. Erythritol is added to the Reb-A sweetener to eliminate the potency of the licorice aftertaste. Large amounts of sugar alcohols are known to cause digestive issues such as gas, bloating, and diarrhea. Cooking and baking with stevia-based products may require some trial and error. If you buy the sweetener in the baking aisle of the grocery store, the brand that you choose may have instructions on the package to guide you. For example, some sweeteners will suggest that you replace sugar with their product at a 1:1 ratio (one cup of sweetener for every cup of sugar required in the recipe). Most sources suggest that you do not use more sweetener than sugar as it will make your recipe too sweet. Using stevia in baked goods can be a challenge at times, again, depending on the specific product that you choose. Stevia doesn't provide the same soft texture as sugar. It also can't caramelize or enhance the browning process. When in doubt, consult the package instructions or visit the manufacturer's website when cooking with stevia-based products. "FDA Approves 2 New Sweeteners". The New York Times (Associated Press). 17 December 2008. Ulbricht, C. et al.An evidence-based systematic review of stevia by the Natural Standard Research Collaboration. Cardiovasc Hematol Agents Med Chem. 2010 Apr;8(2):113-27. Lohner S, Toews I, Meerpohl JJ. Health outcomes of non-nutritive sweeteners: analysis of the research landscape. Nutrition Journal. 2017;16(1). doi:10.1186/s12937-017-0278-x. Lactmed: Stevia. U.S. National Library of Medicine. https://toxnet.nlm.nih.gov/cgi-bin/sis/search2. Food and Drug Administration fact sheet. "Additional Information about High-Intensity Sweeteners Permitted for use in Food in the United States." Tandel KR. Sugar substitutes: Health controversy over perceived benefits. Journal of Pharmacology and Pharmacotherapeutics. 2011 Oct-Dec; 2(4): 236–243. Are Natural Sweeteners Considered Added Sugars? Is Aspartame Good for Weight Loss? Is Coconut Palm Sugar Good for People on Low-Carb Diets? Which Herbal and Natural Weight Loss Drugs Are Safe?